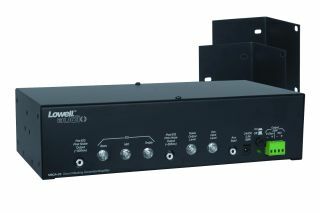 The What: Lowell Manufacturing Company has released a new analog signal generator with 25W amplifier for sound masking applications. The What Else: The SMGA-25 provides an analog pink noise signal that is used to feed masking speakers and mask ambient noise. The pre-EQ output has a flat spectrum for use with equalizers and masking systems requiring precise equalization. The post-EQ output can be adjusted with bass, mid, and treble controls for less demanding applications that utilize basic spectrum shaping. The 25W amplifier has a speaker line output that can also be adjusted by the bass, mid, and treble controls. Additional outputs include hi-Z line level, 8-ohm, and 70V speaker line (25W maximum). The Bottom Line: The SMGA-25 features a sturdy 12-by-6-by-3-inch steel chassis with black finish. It includes a power supply (100-240V AC input, 24V DC output), and universal mounting brackets that are designed to allow a variety of mounting options, including standard 19-inch rack space.